Lucerne, 13 September 2016 – Once a poor man’s food, today the breakfast in vogue: porridge is in. 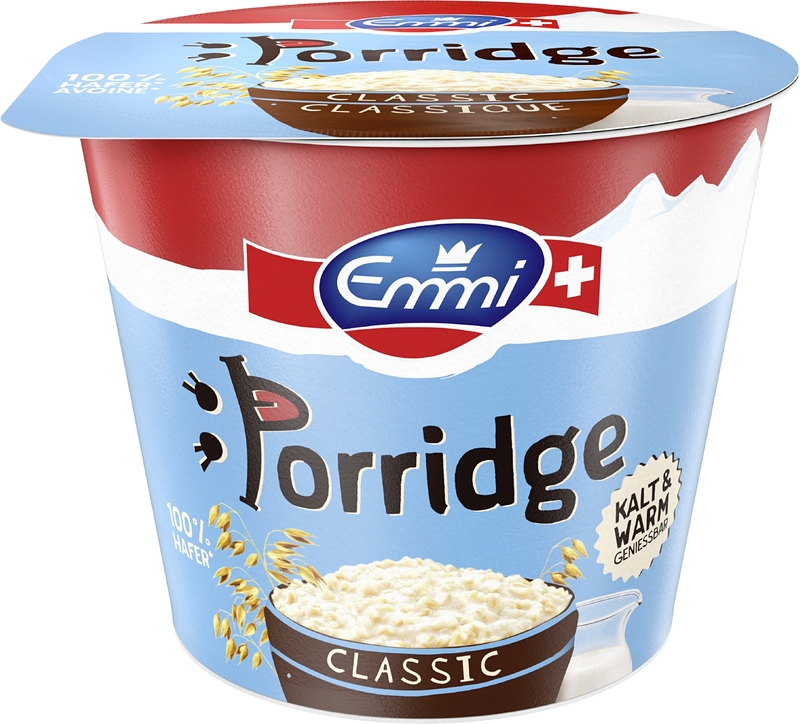 Now, Emmi is bringing the first ready-to-eat porridge to Swiss chiller cabinets. It also sees potential in the United Kingdom, where porridge originated. From October, the porridge made in Switzerland will be available there under the Onken brand. Porridge or oatmeal: this simple, healthy meal is very popular at the moment and features frequently in blogs, on Instagram and on YouTube. Porridge is originally a Scottish dish favoured primarily by working-class families for its nutritional properties and low cost. It also used to be very popular in Switzerland. But the porridge of today has little in common with the soggy, tasteless food of yesteryear. Porridge has shed its stale image and is now a definite food trend. And, just as it always has been, it is healthy. Oats provide the body with vitamins, protein, carbohydrates and fibre. The latter regulates digestion, leaves you feeling full and keeps blood sugar levels in check, preventing you from feeling hungry again soon after eating. With just five grams of added sugar, porridge is the ideal breakfast, or morning or afternoon snack. Swiss stores have already started selling colourful individual portions of porridge. However, these products require water or milk to be added, and often need to be heated for the oats to swell. Emmi is going one step further and is launching the first ready-to-eat porridge in Switzerland. This means that Emmi Porridge can also be conveniently enjoyed at school, in the office or on the train. Of course, those who prefer to eat it warm during the winter can also heat it up quickly and easily in the microwave. Whether warm or cold, Emmi Porridge has a creamy consistency and pleasant bite. It is available now from Swiss retailers (Coop, Spar and Manor) in classic and apple varieties. Porridge originates from Scotland, so it is no surprise that the current porridge trend began in the United Kingdom. Here, it features in numerous food blogs, which offer tips on suitable toppings and ingredients. Nevertheless, UK retailers primarily stock instant products that contain large amounts of sugar. 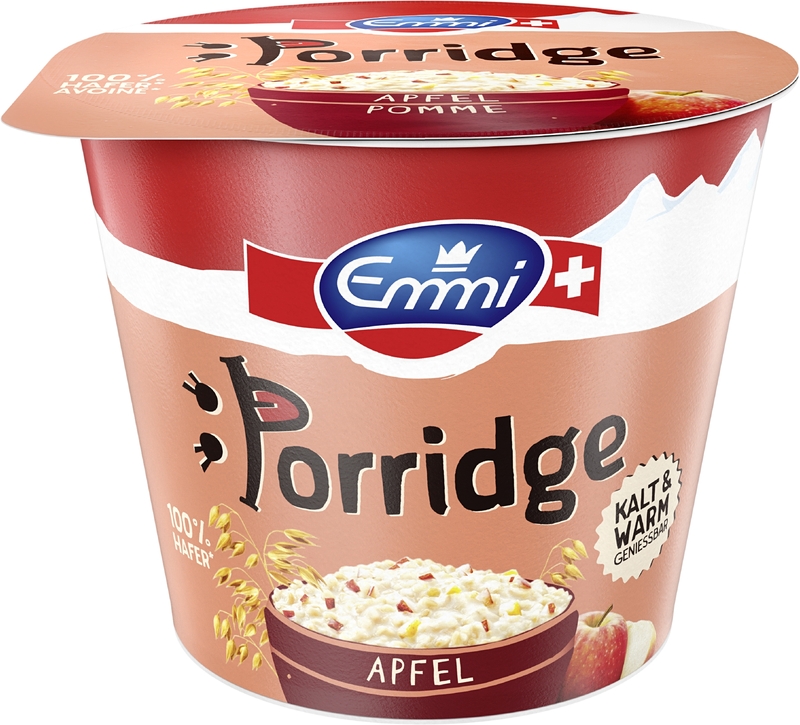 Emmi is therefore confident that its ready-to-eat porridge made in Switzerland can also win over British consumers. From October, it will be available in the United Kingdom under the established Onken brand. Semi-skimmed Swiss milk with 1.9 % fat, 15 % oats, 5 % sugar, modified starch, thickeners (carrageen, xanthan), flavouring. Semi-skimmed Swiss milk with 2 % fat, 13 % oats, 8 % apple, 5 % sugar, modified starch, flavourings, thickeners (carrageen, xanthan).